So Botox. Many Hollywood actors use the stuff but most won't admit to it. 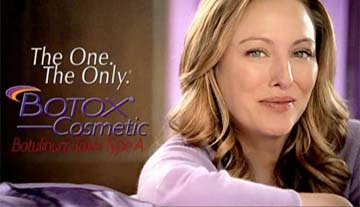 Not Virginia Madsen who openly admits using the stuff and has been the spokesperson for Allergen's Botox and Juvederm since last year. Continuing in her roles as spokesperson for the brand, Madsen will front a new campaign for an anti-wrinkle treatment for Botox Cosmetic which will include broadcast, magazine and online. Madsen appears to be one of the few people who don't go overboard plumping up their lips or other facial features to obscene proportions. Perhaps Madsen should have a conversation with Nikki Cox who appeared in an episode of Jennifer Love Hewitt's Ghost Whisperer with lips so shocking inflated, it was near impossible to look at anything but her lips when she was onscreen. Cox is a good actress. She rose to fame on the WB's Unhappily Ever After as Tiffany Malloy where her only inflated body parts were her large breasts which protruded to enormously dizzying proportions with the aid of push up bras and low cut tops. The tight miniskirts she often wore greatly enhanced the overall effect as well. Following Unhappily Ever After, she had her own sitcom for a couple years and then appeared as a regular character on Las Vegas where she was underutilized and, sadly, succumbed to the anorexic look too many actresses go for when they have perfectly hot bodies to begin with. Her overly skinny look when combine with her still curvaceous breasts and now, exploding lips, has turned her into a cartoonish characiture of her former self. Nikki Cox and Botox = FAIL. Virginia Madsen and Botox = Success. Uh, Steve, I know basically nothing about either Botox or whatever crazy material people are pumping in their lips lately, but I DO know they're not even close to the same thing. One is a paralyzing poison, and the other is an inert filler material. You seem to have blurred that distinction in your assessment here -- that is, what evidence is there that the massively endowed Bobcat-dating Ms. Cox used the paralytic Botox (somewhere) in addition to the mayonnaise she injected in her lips? I saw that episode of Ghost Whisperer and felt embarrassed for Jay Mohr. He�s Cox�s husband by the way.